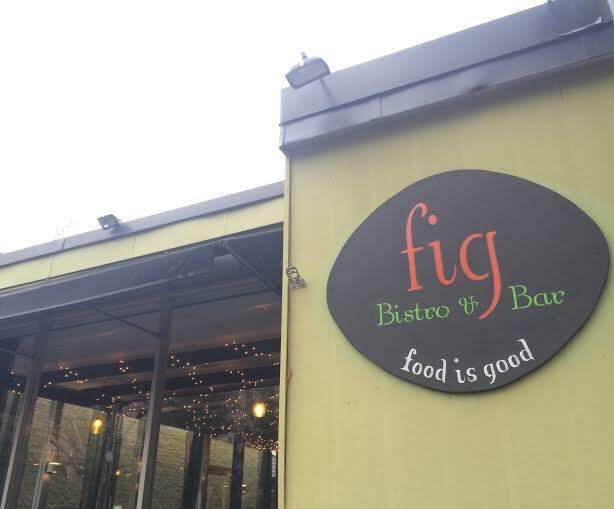 Fig—short for “Food is Good—“ opened in September 2013, and the vision was clear from the start. Owners Anja Andelic and her husband Jozo, who share a Balkan background and a passion for food, have been part of several food ventures in Charlottesville during their sixteen years here, all focused on the traditional food of their native region. First was the stand at the City Market, offering Balkan delicacies like pierogies and baklava. 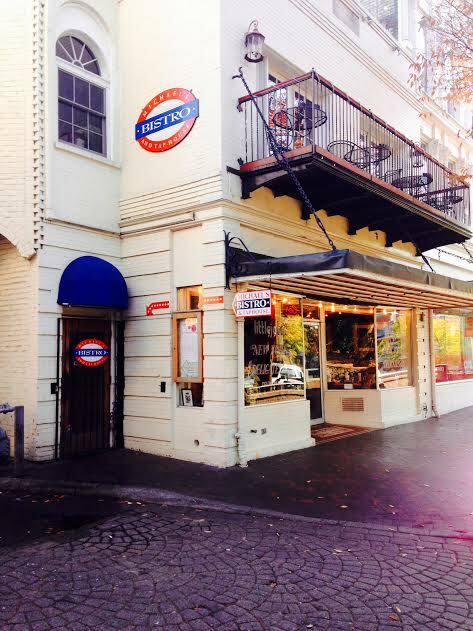 Next came the Balkan Bakery and Cafe, and finally the Balkan Bistro, which closed in 2013. With Fig, the Andelics wanted to continue to honor their Balkan roots, but also do something a little different. They thought that their native cuisine would blend beautifully with one of their favorite styles of food they had encountered in the United States, Cajun. The location feels right, too. In the Spring of 2013, while strolling on The Corner, the Andelics noticed a “For Lease” sign in one of The Corner’s signature locations. Most recently occupied by Cafe Europa, the site once housed the legendary University Diner. Now, it is home to Fig. In overhauling the space, the Andelics worked to create a dining experience that distinguishes itself from other Corner eateries. String lights drape the ceilings, with café-sized tables and a dark wood bar rounding out the room. “I wanted to take the European food experience and bring it to Charlottesville,” Anja explained. That feel is underscored by an intimate setting—with low lighting and a wait-staff in head-to-toe black. Perhaps the most captivating part of FIG’s charm is a large mural covering the front wall of the restaurant. “There’s my dad making the sausages!” Anja said as she pointed at the colorful illustration of her family in various food activities—all revolving around the Charlottesville City Market, from which they get many of their ingredients. The mural reflects the Fig experience —warm and comfortable— like family. When asked what the most popular dishes are, Anja cites four. Fig Salmon—fig sauce, farmers market veggies and walnut mushroom risotto; Shrimp and Goat Cheese Linguini—tomato sauce, goat cheese, and Cajun style shrimp; Lamb Burger— lamb patty, feta cheese, basil pesto on a pretzel bun; and the Cajun Shrimp and Mash Pirogue. The dishes are so popular that on any given night, they are prone to sell out. Anja’s own personal favorite is the Shrimp and Goat Cheese Linguini. “I make the Romesco sauce myself,” she said proudly. As popular as these fusion dishes are, there is one Balkan staple that won raves at all of their prior ventures and still makes a special appearance every now and then at Fig. Cevapcici are handmade Balkan sausages typically served with fresh flatbread and chopped onions. Some have called them one of the best dishes in Charottesville. Psst, we hear they will be on the specials menu next week. Founded in 2011 by Lex Gibson, The Pigeon Hole is now run by Hannah Thompson and Steven Stitz, who acquired it in January. Gibson first worked at the restaurant in its prior incarnation, a dive bar called L7, which she managed before the owner decided to move on, and gave the place to Gibson. Gibson reinvented the venue as a “home away from home” for people to meet and eat. 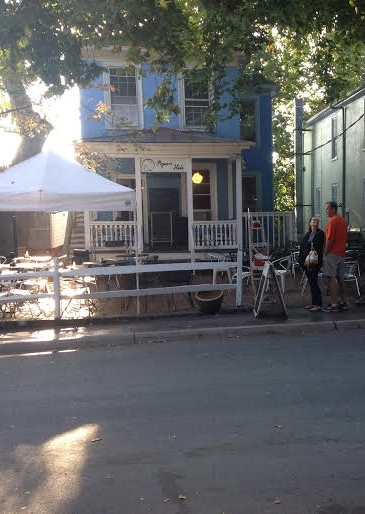 Both Charlottesville natives, Gibson and Thompson noticed when they were growing up that, in the shadow of the University, few Corner eateries catered to locals. The Pigeon Hole is designed to do just that, while also appealing to the University crowd. Although Gibson has moved on, she still checks in often on the home away from home she helped to create. By design, The Pigeon Hole is a place to feel warm and at home. “There’s a lot of love here,” said Thompson. “It was built on love, and has continued to thrive on more than ‘let’s just sell food.’ It’s more ‘let’s make relationships with people.’” Much like in a home, the whole staff is virtually interchangeable, trained to perform every task from serving to hosting and eventually to cooking. The aim is for the quality of service to be as good, if not better, as the food. The homey feel has particular appeal with families. “We are the place where students bring their parents,” said Thompson. “We are the safe place to bring grandma.” Right on cue, during our meeting a guest approached our table and said how much she admired the cozy feel of the Pigeon Hole. And, cozy it is. How many other restaurants supply warm blankets so guests can bundle up and sit outside all winter long, if they please? The food matches the mood. “Simple. Classic. Comfortable,” said Gibson. “Straight up stripped down, happy wholesome, flavorful food.” As such, Stitz, who runs the kitchen, balks at the term “chef,” finding it too formal for what he sees himself doing. No formality here. During our visit, as a cook rang the bell announcing an order up, you could hear him belting “September” by Earth, Wind & Fire. When Thompson and Stitz took over in January, they revamped some of the menu but kept the classics, including Huevos Rancheros, which is probably the most popular item among regulars, and happens to be Stitz’s favorite as well. Hearty black beans are piled high with grated cheddar cheese, green onions, and fried eggs, and them smothered with a smoky chipotle sauce. Also popular is the ever-changing “best French toast ever” special. One recent rendition, Pumpkin and Apple Butter French Toast, featured Great Harvest’s cinnamon chip bread dipped in homemade pumpkin batter and stuffed with house-made apple butter. In fact, with the exception of the bread, nearly everything is made in-house, from scratch. Crafaik passed away in 2008, but his longtime staff stepped in to sustain what he created. Spetz, who first managed the bistro in 1994, returned as owner to carry the torch. “My life came full circle and I was back at Michael’s Bistro.” Throughout her tenure, executive chef Matt Lechmanski has manned the kitchen. Lechmanski was on the bistro’s staff before that, and has been in the restaurant business as long as he can remember, starting out washing dishes as a teenager. “I’ve spent the better part of my life chained to a stove — happily, mind you,” said Lechmanski. While Spetz and Lechmanski have been with the bistro for years, other folks have found it a good place to learn the ropes before running their own restaurants around town, like Maya, Blue Moon Diner, Ace Biscuit and Barbecue, and Brazos Pop Up Taco Shop. “We are not above pretension, but we are above Littlejohn’s,” they will tell you with a sly smile. Hardwood stairs lead you up to the Bistro, where the walls are lined with wooden booths. The light is dim. The mood is relaxed and comfortable. Glass doors open to a balcony of rod-iron tables—overlooking the constant shuffling of the Corner. “As far as location goes, I don’t think it could get any better,” Lechmanski said. Yet, Lechmanski and Spetz have also found that the location brings with it pressures that are unique to the Corner. The Bistro has long been committed to using local food and ingredients wherever possible. At the onset, before the locavore trend, this was a bold choice, but at Michael’s Bistro, they consider it a responsibility. Chalkboards by the bar list local suppliers like Timbercreek Farm (their first), Polyface, the Local Food Hub and the Spice Diva among others. The Bistro soon plans to add to that list Goodwin Creek Farm & Bakery and source all of their bread from the Afton farm. This committment to local sourcing comes at a price. A menu of high-end, local food puts the Bistro to the test on the often more causal and student-priced Corner. “It can be challenging to do things right, but keep things affordable. We’re not doing mozzarella sticks,” Lechmanski said. “We’re doing a lot of the same local foods that people midtown and downtown are doing,” Spetz explained, “but we can’t charge those prices. We have to do it as well as others, but at Corner prices.” Reasonable prices make the Bistro accessible to anyone, from students to faculty to those just passing through. The Bistro’s specials are always changing, depending on what’s available from suppliers. The regular menu changes seasonally as well, and the Bistro is about to make the switch to their fall and winter menu. Lovers of the longtime fan-favorite chicken pot pie can rest assured that the wait is almost over.